HomeBlogJesus’ Baptism / My Baptism – Are They So Different? 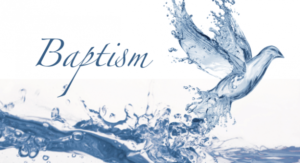 Jesus’ Baptism / My Baptism – Are They So Different? Throughout my life I have had many friends and acquaintances who have been loyal members of evangelical churches. These people are faith filled and extremely committed to the teachings of their individual churches. We have had many conversations over the years on the “taboo” topic of religion, and I have been blessed and enriched to learn of the faith principles that guide their lives. One question that would often be posed to me, and to be honest, would frequently intimidate me, was: “are you saved?” They would often be able to quote an exact day and time when they were “saved” and gave their life to Christ. For a good part of my life, the reason I was intimidated was that I didn’t have an answer. The best I could come up with was: “I hope so”. Now, years later, I have a much better answer to offer. (Mind you, it could hardly be much worse). The answer, of course, is a resounding YES. I am saved because I am baptized. In the earliest times of our church, baptism looked a lot different than it does now. It happened outside and was the culmination of a lengthy journey filled with much prayer, catechesis and soul searching. One thing that was very similar to the journey today is that the catechumens were told virtually nothing about how the baptism ceremony would look. (The idea was and is that they would just experience the rite, as opposed to anticipating what was coming next.) On the night of their baptism, most often Holy Saturday, they would be taken out to the nearest body of water. They would be accompanied into the water by the presiding minister. After being asked one final time if this was truly their desire, they would be plunged backward into the water as the words, “I baptize you in the name of the Father, Son and Holy Spirit” were said. They would be held under the water until almost kicking to come up for air. This is the dying with Christ that is often lost in our modern day sprinkling of water. When they would be brought up from the water they would have an initial gasp for air. This is their first breath in their new life in Christ. They are indeed “saved”. Every year when we celebrate this feast of the Baptism of our Lord, I find it so intriguing that Jesus felt it was necessary to be baptized. Why? I wonder. I don’t think it was salvation that he was seeking. Maybe he was establishing the template for our faith journey. Being a Christian carries with it a call to evangelization and to ministry. Baptism brings the grace and gifts we will need to accomplish this daunting task. In that light, Jesus’ baptism makes perfect sense, as you cannot give what you have not yet received. After all, Jesus’ public ministry did not begin until after he was baptized.